Glad I had that cup of coffee so I could stay up & watch transfer deadline day. I think this is the best deadline day yet. I'm gripped. Wish Piers Morgan would shut up --- one striker will not make us ( Arsenal) as good as Man City --- and since when did he no more about football than Arsene Wenger? So Fulham have won #TransferDeadlineDay ? Thievy to West Brom officially announced by Espanyol. Loan until end of season; €500k plus €100k possible extras. Good signing. Fascinating insight about #DeadlineDay from Will Keane there. West Brom have signed Thievy Bifouma on loan from Espanyol. It was inevitable that Pepe Mel would pop back to Spain to do his business, wasn't it? Still no confirmation on Konoplyanka. Deal close (ish) but still not done. Would be a huge blow if Liverpool can't get it over the line now. 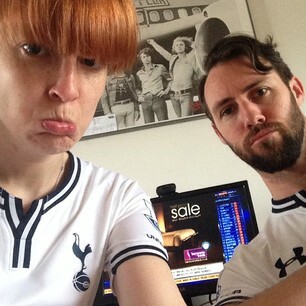 Judging by that photo, Spurs fans aren't too happy with their club's business this January. 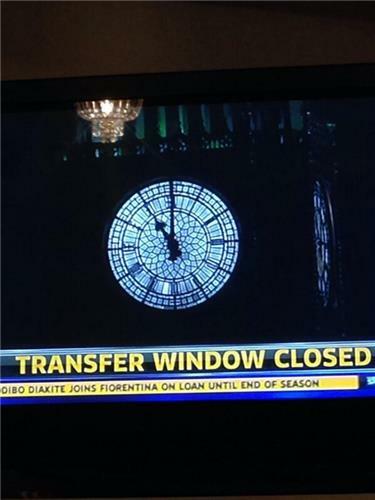 The January Transfer Window has officially SLAMMED SHUT. Wow. Another let down by Bill Kenwright. Waiting on two transfers really. Liverpool's move for Yevhen Konoplyanka and Crystal Palace's deal for Joe Ledley. I am delighted to announce the signing of the best young CB in the FL Jack Baldwin for £500k. Posh fans will love this young man,trust me! Been working on this one all week & has been our Number 1 target all month, a lot of top clubs wanted this lad, ambition over greed!!! DONE DEAL - Jack Baldwin signs for Peterborough United from Hartlepool for £500k. No! There is reportedly a problem with the computer system which processes all the transfers so maybe that has something to do with it. It's not my fault! But yes, Arsenal have of course added to their midfield options with Kim Kallstrom and maybe got Park off the wage bill. They tried for a number of strikers but obviously decided no deals would've been better than Giroud or Bendtner. DONE DEAL - Chu-Young Park joins Watford on loan from Arsenal.